← Will Princeton’s New Housing Goals Promote Walkability and Diversity? Beyond those goals, the Campus 2016 plan envisaged a significant amount of new construction, to ensure that the University’s facilities were up-to-date and able to serve its purpose. 2.1 million square feet of new built area was planned, and, incredibly, most of this has been built. These include Sherrerd Hall, The Neuroscience and Psychology Buildings, and major new housing facilities at the Lakeside and Merwick sites. Much of this construction has been to the highest sustainability standards, such as the new Andlinger Center, a LEED Silver facility with a ‘green roof’. 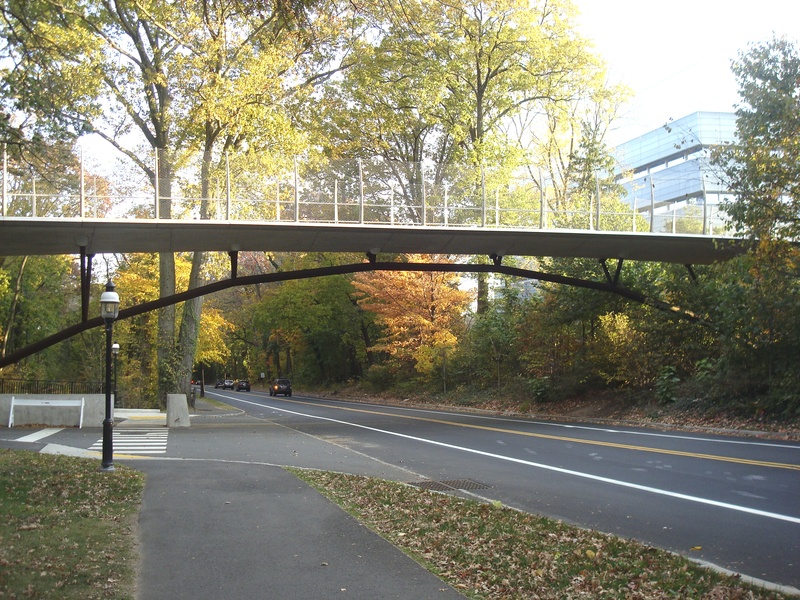 Many of the projects also show really impressive architecture and design, perhaps typified by the understated Streiker Bridge (pictured above), which brings together the campus on either side of Washington road, and which contains advanced sensor technology to monitor its performance. 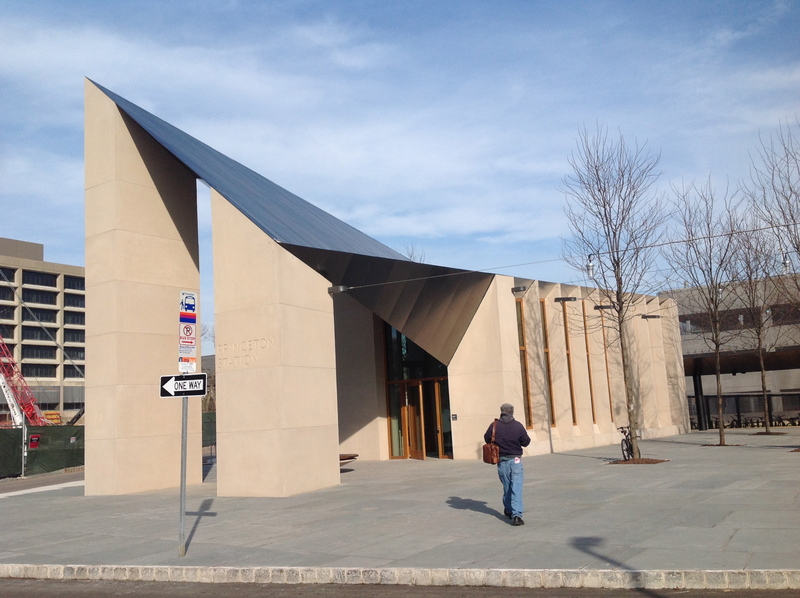 By concentrating new facilities around the core campus, Princeton University has largely succeeded in maintaining a walkable environment. The concept of the walkable campus is baked into the Campus 2016 plan, and sites were selected specifically to enable people to get around without using cars. This focus adds to a tranquil campus atmosphere that stimulates community, scholarship, and an excellent student experience. On the other hand, preserving the ‘park-like’ character of the Princeton University campus resulted in the biggest controversy in recent town-gown relations. The Campus 2016 plan involved truncating the Princeton Branch rail service by the equivalent of about a block, to make space for a new ‘Arts and Transit’ site. This led to consternation and court cases from a number of local residents, who preferred to maintain the existing rail terminus. The new Princeton Rail station at Alexander Street (click to expand). It makes sense to avoid having trains run through a University campus if the goal is to have a ‘park-like’ atmosphere. The University has form in prioritizing people walking and cycling around campus, having closed College Road to motorized traffic in the 1960s. Closing College Road was controversial at the time, but is now almost forgotten, and it is hard to imagine what the campus would be like if College Road was still a major traffic thoroughfare. But moving the ‘Dinky’ train station certainly caused strain with the local community, despite being part of a plan that had a specific goal to ‘sustain strong community relations’. More generally, a section of the local community (but certainly not everybody) stands in opposition to the types of University expansions that have come from the Campus 2016 plan. This could make future University development more difficult. Despite the controversy over the Dinky, Princeton University’s Campus 2016 plan has been a huge success, blending tradition with vision for the 21st century, and adding to a sense of place. It is incredible how the University has managed to get so much done in such a short period of time, but on the other hand, world-class places cannot stagnate or rest on their laurels. If anything, the University’s redevelopment has not gone fast enough. Accommodation for University-associated staff and graduate students is insufficient. New ‘Complete Streets’ measures on the Alexander corridor are not up to the highest standards. And for whatever reason, planned redevelopment of the Butler tract and the site adjacent to Princeton University Stadium has not been completed. These present opportunities for the next Campus Plan, which is currently under development. This entry was posted in Alternative Transportation, architecture, Community, Complete Streets, Placemaking, Princeton, Sustainability, Transit, Walking and tagged Complete streets, planning, Princeton, Princeton University, Transit. Bookmark the permalink. It is actually traditional to run streetcars and “urban rail” through parks. Look at 19th century park diagrams — they made explicit points of streetcar access, including deliberately running streetcar lines through the middle of their parks. So no — it doesn’t make sense to remove the train from the campus if you want a “park-like” atmosphere. Look at “grass track” designs for really appropriate ways to run a streetcar through a park.